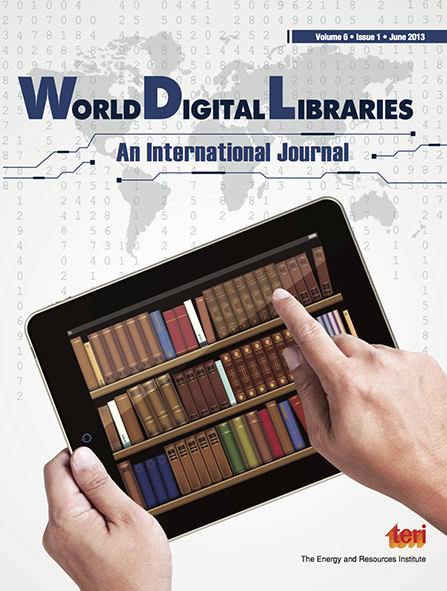 World Digital Libraries is an international peer-reviewed bi-annual journal. The journal seeks quality research papers that present original theoretical approaches. It also seeks experimental case studies related to digital library developments, maintenance and dissemination of digital information focusing on research and integration of knowledge at the interface of resources and development. The journal will, therefore, keep readers abreast with the current developments and contain articles, reviews, current developments and case studies, encompassing the following areas. Theoretical and methodological issues that relate to the interrelationships among electronic resources management, digital preservation, multiple access, multilinguality, copyright issues and security aspects. Theoretical approaches as well as experimental case studies related to digital library development and maintenance. Initiatives towards digitization through lucid case studies. Current developments across the globe. Dialogues between the scientific community and society at large. Please contact editorial@iospress.nl for information.